Veteran journalist Tristram Korten has chosen as the subject of his nonfiction book debut one of the worst U.S. maritime disasters in the last 40 years, the loss of the massive cargo vessel El Faro with all hands to Hurricane Joaquin in the autumn of 2015. It's a dark and troubling subject, and Korten brings it to life here in two overlapping ways: he does a massive amount of research and reporting, interviewing everybody connected with the disaster and sifting through thousands of pages of documents and official findings, and he contrasts the El Faro's fate throughout with that of a second, much smaller vessel, the Minouche, which also found itself in the storm's path. The fact that the Minouche was a smaller vessel – 230 feet to the El Faro's 790 – is ultimately immaterial, since Joachin at its strongest could have crushed a fleet of ships in minutes. Korten does an excellent job of describing the nearly indescribable power and ferocity of major hurricanes and their blanket way of turning discretion into the better part of valor. Facing the prospect of even a glancing brush with the periphery of a storm like Joachin, ships simply cut their losses and flee for the nearest safe harbor. Except the El Faro. Under the command of Captain Michael Davidson and armed with up-to-date information about the location and vastly increased strength of the hurricane, the ship sailed too close to the storm and sank. The captain and his crew all died. The Minouche, under the command of Captain Renelo Gelera, behaved far more prudently and even so nearly perished, but for the near-superhuman heroics of the Coast Guard helicopter rescue team that loaded survivors in the middle of towering swells and screaming wind and spray. The master was ultimately responsible for the vessel, the crew, and its safe navigation. The master misjudged the path of Hurricane Joaquin and overestimated the vessel's heavy weather survivability, while also failing to take adequate precautions to monitor and prepare for heavy weather. During critical periods of navigation, where watch standers were looking to the master for his guidance and expertise, he failed to understand the severity of the situation, even when watch-standers warned him that the hurricane was intensifying and that El Faro's projected closest point of approach was decreasing. The MIB went on to assign secondary and tertiary blame to a handful of other factors, mostly boiling down to the typical corporate inertias of the El Faro's parent company, and this, added to an understandable desire to soften the grief of Davidson's wife and loved ones, has prompted many commentators on the disaster to give these secondary factors more weight than they deserve. The most bloated corporate rule-system in the world couldn't have killed the El Faro when she was running free on the open ocean – only terrible luck or terrible decisions by her captain could have done that, and the happier fate of the Minouche proves that the bad luck of being in Joachin's vicinity need not be fatal. Captain Davidson bears all the blame for what happened to his ship. Korten wisely chooses to broaden the focus of his gripping book beyond blame assessment, however. More than any other account of this disaster (as of this writing there are three books and dozens of magazine articles) is likely to do, Korten brings readers inside the world of the rescue crews whose incredible courage so often makes the difference between life and death in catastrophes like this one. And our author, living and writing in Florida, is also mindful of the fact that monster storms like Joachin are increasingly common. In August of 2017, for example, Hurricane Harvey dropped forty inches of rain on Houston, the wettest tropical cyclone on record in the US; a month later, Hurrican Irma, the strongest Atlantic hurricane on record, made landfall in the Caribbean and the Florida Keys; shortly afterwards, Hurricane Maria devastated several Caribbean islands and wiped out the power grid of Puerto Rico; and, as Korten reminds his readers, in that same season Hurricane Ophelia proved that nobody is safe from such storms by pivoting farther east than any Atlantic hurricane in recorded history, taking it on a track for Ireland. Korten does a smooth, convincing job of weaving the story of the El Faro and the Minouche into the story of this drastically altered reality of Atlantic behemoths. 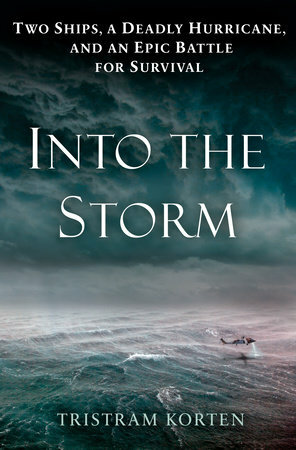 In this way Into the Storm reads like more than just the chronicle of one maritime disaster – and maybe a warning claxon against the possibility of more such disasters coming this hurricane season.